As you can see, a lot has changed in the designs of these 7000-series cars compared to older models. The carbody is now stainless steel, corrugated below the windows, vs. the smooth aluminum of past models. The brown paint on the carbodies is gone. The fronts of the cars are now steel and a darker gray, similar to the R160 cars in New York. Also note the Metro logo on the front. On the sides, the cars now feature two destination signs per side, vs. one on earlier models (the Rohrs, however, did have two signs originally, but one has since been converted to an exterior speaker). The exterior speaker has also been moved to the center of each car. As far as markings on the sides go, all markings have been moved to the opposite sides of the doors than where they were before. The Metro “M” has been made larger on the blind end, and the cab end logo is smaller, but has been worked into the word “AMERICA’S”. Additionally, the window by the blind-end seats has been made the same as all the other windows, and the red-white-blue striping at the cabs has been retained. On the interior, they’ve jazzed it up a bit as well. They’ve changed the seats to one made out of stainless steel, as I understand it, and covered the seats with cloth, vs. the vinyl cushions on the older cars. The seats are taller as well. The floor plan appears to be similar to that of the Alstom 6000-series cars, with two pairs of seats removed from around the center doors, the wall-mounted grab bars, and the lack of windscreens. Additionally, these cars contain metal “straps” for people to hang onto. The carpet has been traded for a hardier floor covering. The color scheme shown here, which may not be what they ultimately go with, has blue seats with bits of other colors thrown in there, white walls, and black flooring. I cannot tell if they added flecks of white to the flooring, or if that’s just an artifact in the image. Then there are also going to be wall-mounted LCD displays showing electronic maps and such. Operationally, however, these cars would be so advanced that they would be incompatible with the Rohrs, Bredas, CAFs, Breda Rehabs, and Alstoms of today. That would require careful planning on Metro’s part, as one could not, for instance, mate a Rohr pair to the new cars and expect all the cars to work together. First of all, I like the double destination signs and the stainless steel exterior. While I will miss the brown stripe, since it’s currently one of Metro trains’ defining marks, I won’t be picketing the Jackson Graham Building or anything to see that Metro retains it. I’m a bit on the fence about the corrugated sides, but I suppose it adds a nice decorative touch. I like the new front, and the “M” logo on the front, and the larger “M” logo on the blind end makes for a nice touch. On the interior, I think that the LCD screens, which, in the conceptual images, show a strip map, are a nice touch, and it’s something that I’ve wanted on current Metro cars for some time. My understanding is that the Rohr cars as originally manufactured had interior strip maps with the roll signs, but with the conversion from roll signs to electronic signs, the strip maps were abandoned. Metro now runs in-house advertising in that location on the car interior. 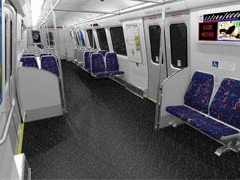 I also like the idea of the hardier flooring, because anyone who’s seen the carpet of a Breda 3000-series car that hasn’t been rehabbed yet will tell you that those carpets have seen better days. Plus Metro has to replace the carpets quite a bit. On the issue of the hardier flooring, though, I have to say I’m somewhat mixed. The trick here is to pick a color and pattern that won’t show a lot of dirt. If you pick one that’s too dark, you can readily see a lot of dirt. Likewise, if you pick one that’s too light, you see all the dirt. When I went to Chicago recently, I noticed that on the trains, with their brown floor covering, you could see a lot of dirt on the floors. In fact, I wasn’t too impressed with the cleanliness of any of their cars, partly for the floors. I hope WMATA’s new cars don’t end up looking like that. As you can see, there would only be room for four windows on each side (not counting the cab window) when you account for the doors themselves, and the door hardware. However, the doors themselves still have windows, and if you count the window in the new set of doors as a window, you end up with a net loss of only two windows per side. Of course, the interior design would have to be modified if Metro were to go with a fourth door per side. However, they might be afforded some more flexibility here, as the conceptual drawings provided indicate that the hardware that lives under the double-ended seats in older models is not present in the new cars. If that is actually the case, then they can design the interior almost any way they want. Otherwise, on the exterior, the only thing I take tremendous issue with is that “America’s Metro” logo design. I live in the Washington area. I am a daily rider of Metro. This isn’t “America’s subway” as much as it is Washington’s subway. And when the rest of America rides our system, they tend to get in the way, clogging up the escalators and crowding the doors. There are times that I’ve wanted to punt the tourists down the escalator because they’re just hanging out on the way up, and have no clue that the right side is where you stand, and the left side is where you walk. And standing on the left means that you are in my way when I’m hoofing it up the escalator. So just another big “M” like on the blind end will be fine for a cab-end logo, thank you. On the interior, I’m surprised Metro showed the Alstom floor plan. I don’t know if this is just because they needed to throw something in quickly to make the illustration, but the Alstom plan still suffers from the move-to-the-center problem that the others do, albeit to a slightly lesser extent. Personally, I think I’d do a cross between bench and row seating. Thus you’d have bench seating on one side, and rows on the other. Switch it around in different ends of the car for variety – sure. All in all, it would give a little more aisle, and a little more standing room. As for the seats themselves, I’m not particularly impressed. Yeah, they look better than the bus seats that they tested on Breda 3283 last month. However, the design of the backs make them look too compartmentalized, and doesn’t make for a smooth line. The current WMATA seats look like a single unit with two cushions on each part. If Metro is going to go to the new style of seat, they might as well go for a bench-style seat, even on front-and-back facing seats. It would make for a cleaner look, without all those individual seat backs sticking up. However, I’m very happy that they decided not to use those stupid lean rests that they tested on Breda 3283. Now as far as creating a fleet of incompatible rail cars goes, Metro really needs to think long and hard about this, because that’s one thing that they’ve been doing for a long time – making a compatible fleet. Anyone who’s ever ridden a train that consists of three different car classes has seen the benefit to Metro of having a compatible fleet, as they can put just about anything together and put it in service. However, things aren’t perfect, so those mixed sets have a tendency to give some rough stops at times. Still, Metro is married to its existing fleet as it stands for quite some time now, as a rail car is supposed to last 40 years, with a mid-life overhaul at 20 years. Right now, the Rohrs are past their rehab, and will likely be retired around 2016. The 2000-series Bredas saw their rehab in 2003 and 2004, and so I’d predict that they would be retired around 2024. The 3000s are still being rehabbed, and that job is getting close to being finished. I’d guess the 3000s will last until 2027. Those cars are all past rehab, and likely would not receive any more major upgrades during their service lifetimes. The other car classes have not yet been rehabbed, and so they could possibly be made compatible with the proposed new cars later, as the 4000s are going to be up for rehab in 2011 (that’s three short years from now), and then the CAF cars will be due for rehab in 2021, and the Alstoms in 2027 or so. In short on that one, I think that the new features of these cars would be awesome if they can actually get them to work reliably (there are CAF cars whose interior displays still don’t work reliably), but it might make things a bit more tricky for Metro, running two distinct versions of their rolling stock. New York seems to do well with two kinds of incompatible rolling stock with their A and B divisions, but those are designed for differently-sized infrastructure that came about because of how the system there developed. And lastly, one thing I’m surprised about: Automated train announcements. I didn’t expect Metro would jump on automated announcements for its trains due to the history and rationale provided for going with live announcements. On the Rohr cars, as I understand it, equipment was originally provided to do canned announcements, but they ran into issues with the system and never actually fully implemented it. The equipment was later removed. Later, during then-Metro general manager Richard A. White’s tenure, White indicated that the live announcements existed in part to help keep the train operators engaged. After all, since Metro’s trains often run in an automated mode, I could imagine life as a train operator can be quite dull at times. Thus canned announcements were a surprise. There were canned announcements in Chicago, and while they were certainly easy to understand, it took away that personal touch that you get on Metro. Metro’s operators honestly don’t sound as bad as people make them out to be, but it goes back to like how people can’t understand a song – if you don’t know what you’re listening for, it’s hard to understand it sometimes. Like if you have the words to a song, all of a sudden the voices singing become crystal clear. Web site: Several. 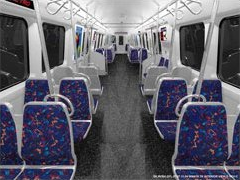 From WMATA: Metro considers new look for trains. From Express: New Rail Cars Would Be Big Shift for Metro, and Metro Considers New Look for Rail Cars. From The Washington Post: Metro Eyes a Makeover, and Talks Underway for New Trains. Quote: Oh, and as a follow-up from the previous entry, my car is now at the Firestone place in Wheaton, getting a whole bunch of work done. I took a bus back home from there. They're going to call me when they're finished.